Coconut Milk 1st extract: 1 cup. Coconut Milk 2nd and 3rd extract: 1 cup each. Thinking about pidi will bring a lot of childhood memories for me, especially those days I spend at my mom’s house. My granny loves this dish so much, so that she makes it most of times when we have a family get together or on special days like Eid etc. I remember helping her in rolling out small balls off the dough, which is the most time consuming part in making of pidi. Sieve the roasted rice powder using a fine mesh. In a vessel, boil three glasses of water with powdered cumin seeds, turmeric powder and with a teaspoon of salt. When it boils add the rice flour with constant stirring (For 1 cup of rice flour take 1 cup of water). Do not keep it idle because the flour will get burnt and stick to the bottom. Keep it on simmer for 10-15 seconds. When the water starts boiling and comes above the flour, turn of the flame. Apply some coconut oil to your palms and knead the dough thoroughly with your hands, as you do it for making of pathiri. Do it in a single stretch. Knead it until the dough becomes uniformly smooth and less sticky. 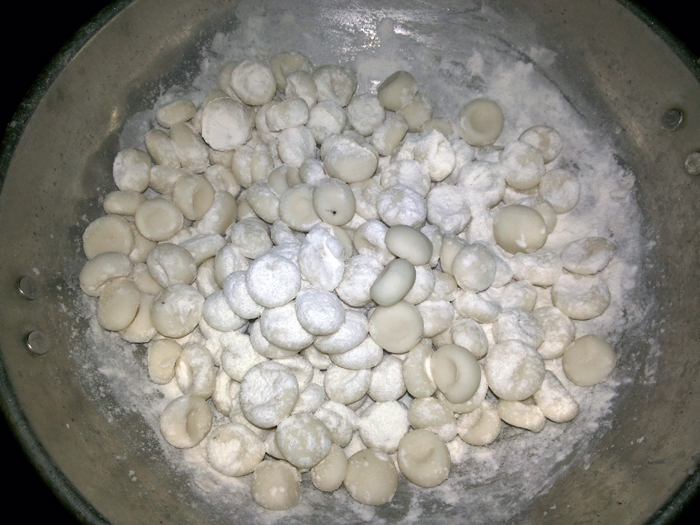 Roll out small portions of the dough into tiny marble / gooseberry sized balls and slightly press the ball in centre with your palm (see figure below) to give them the shape – keep it aside in a flat vessel/news paper with some rice powder sprinkled on that (this will prevent the balls from getting attached with each other). In a large bottom vessel, boil the second and third extract of coconut milk together – allow it to boil slowly – reduce the flame to low. Drop the rice balls (dumplings) one by one into the coconut milk carefully and stir continuously. Mix 1/2 glass roasted rice powder with 1 glass water and pour this mix into the vessel with constant stirring – (to adjust the consistency). Cook till it becomes a thick gravy / when the desired consistency reach – need constant stirring all the time. Check the salt and add if needed at this point. Remove it from the stove and keep it aside. Keep it stirring in between (2-3 times) for the next 10-15 minutes. For seasoning – In a kadai/pan, pour some oil/ghee and add the shallots and curry leaves – saute it. When shallots gets almost cooked, pour the first extract coconut milk and allow it to boil for two more minutes. Add the seasoning mix to the pidi cooked earlier and keep stirring (to reduce the consistency and to flavour it). Remove from the stove . Serve the pidi hot with beef varattiyathu, chicken curry etc. 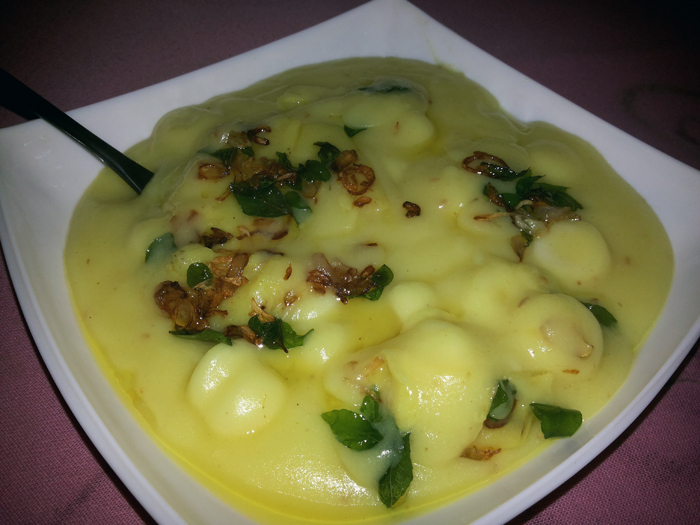 This entry was added on March 26th, 2018 by Cini P Moideen in Non Veg and tagged with taste time kozhi pidi, sweet pidi recipe, erachi pidi recipe, erachi pidi, thikidi, ari pidi, kozhi pidi-taste of kerala, break, pidiyum kozhiyum. Last revised on April 6th, 2018.